Crime is in Katarina Bishop's blood. Her parents, her uncle, and everyone she knows are successful con artists, always looking forward to the next heist. Sick of that life, Kat scams her way into a prestigious boarding school, hoping to leave it all behind. But she's forced back into that world when several invaluable paintings are stolen from Arturo Taccone, a dangerous man bent on vengeance, who accuses Kat's father of being behind the theft. Kat knows her father is innocent, but Taccone wants only one thing: his stolen property returned. And with her father being constantly tailed by Interpol, that leaves Kat and her group of friends to pull off the impossible. Heist Society is much like an Ocean's Eleven for teens, and it has many of the same excellent elements—intelligence, friendship, quick thinking, and familial drama—that made Carter's Gallagher Girls series so popular. 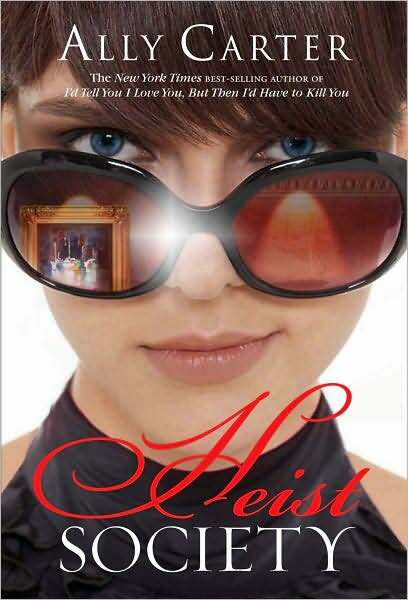 Though at first Heist Society seems to lack the charm and charisma of Carter's sharp teen spies, the quirky, humorous characters, their easy camaraderie and the dilemma Kat faces will quickly win readers over. Carter packs in a lot of tension and suspense when Taccone gives Kat a deadline to return the paintings, and she must figure out how to give him what he wants while staying a step ahead of him and come out on top. Carter also addresses morals in the book, adding the enigma of a Romani Visily and playing the idea of returning stolen art and artifacts to their rightful owners. Kat's team is full of clever tricks and will keep readers laughing, as well as intrigued as Kat has a different relationship with each one. Kat's feelings for newcomer Nick are a little confusing at first, but everything becomes clearer in the end with a most impressive heist and the requisite unexpected twists. Carter leaves Heist Society with an open ending, hinting at more books to come. Overall, though it is perhaps a little more serious than her other books, Carter has pulled off an exceptionally clever read. Cover Comments: I am loving the cover! I like the extravagance of the font and the paintings reflected in the girl's sunglasses, and I especially like the smile she's wearing--very nice! Book borrowed from the wonderful Shanyn of chickloveslit.com! By the way, if you are looking to own Heist Society, Amazon is selling it at a very low price--a hardcover for less than $7! You can't even get most paperbacks for that price! I thought this book was okay, I didn't find Kat as charming as Cam & Co and the beginning was a bit slow. But, over all, I did like the Oceans 11 feel of the book and the cover is lovely, I really like it. It's a bit cheeky. I recently listened to this book and loved the voice. It has more edge and depth than her spy series, which I also enjoyed. I really enjoyed this one, though I haven't read Gallagher Girls for comparison. I loved this book. I was hesitant to read it at first because, honestly, the cover and the name didn't grab me whatsoever. But I'm so glad I did. Very clever and charming read. oooh! That is so tempting (i.e. the cheap hardcover)! I loved this book - very fun and engaging.